The money that is collect by the book raffles at the monthly meeting and at the raffle during our Chistmas Banquet goes directly to Preservation. All of the books and othe items have been donated, so 100% of the proceeds goes to the CWRT Preservation fund. If you don't need another book, but want to support preservation, toss a dollar or two into the "hat" passed at the meeting. All the money goes to CWRT Preservation projects. $500.00 donation to the Evergreen Cemetery Association for a gravestone on the unmarked grave of Allen Frazier at Evergreen Cemetery. Speaker Paul Shevchuk donated his speaker fee to The Dwight D. Eisenhower Society in the name of the CWRT. The Society has given a membership to the Roundtable. For more information on the Society, visit www.dwightdeisenhowersociety.org. Center. This was at the request of Scott, in lieu of payment to him for our 2018 Field Trip. The Roundtable dontated $500.00 to the HGAC towards their project of GAR Hall window repair & restoration. Ben Neely, Director of Adams County Historical Society was presented with a $500.00 donation toward the Capital Campaign for a new home for the ACHS. 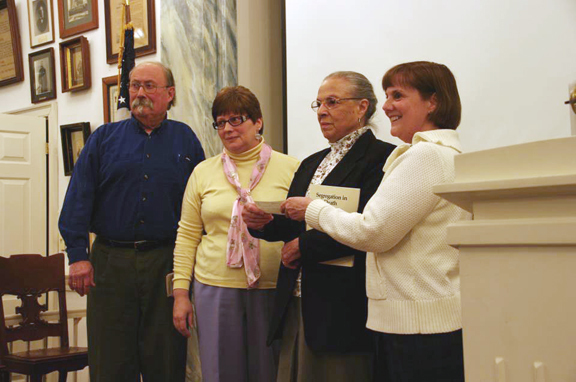 The Roundtable donated $500.00 to Save Historic Antietam Foundation. The Roundtable donated $500.00 to The National Civil War Museum. The Roundtable donated $570 to Boy Scouts of America Troop 88 for Adam Andrew's Unity Park project. The Roundtable & its members made a Donation of $500.00 to the Lincoln Cemetery Project Association in its continuing efforts of preservation. Ms. Betty Dorsey Myers was in attendance at the March meeting and accepted the Donation on behalf of the Association. A $500 donation to the Civil War Preservaton Trust was made in memory of Cal Doucette. Cal Doucette was Living Historian since 2000. He portrayed in first person Horace Greeley. He presented his program to Civil War Roundtables, Gettysburg National Military Park, Rupp House, Historical Societies and other localities in Gettysburg. He belonged to the Civil War Presentation Trust, Gettysburg CWRT, Adams County Historical Society and the Marilla Historical Society in Western New York. Volunteering at the GNMP and the David Wills House is a privilege he enjoyed by living in Gettysburg, Pennsylvania. It is with profound sadness that we inform you of the passing of one of our own. Gettysburg Round Table Board Member, Cal Doucette, departed this life on Friday, December 7, 2012. Cal played an active role in the Round Table for many years and was always generous with his time and energy. He was well-known throughout the Gettysburg community and will be greatly missed by all who knew him. I am pleased to announce that the Gettysburg Civil War Round Table will be donating $500.00 to the Civil War Trust, in loving memory of our own Cal Doucette who passed away last month. 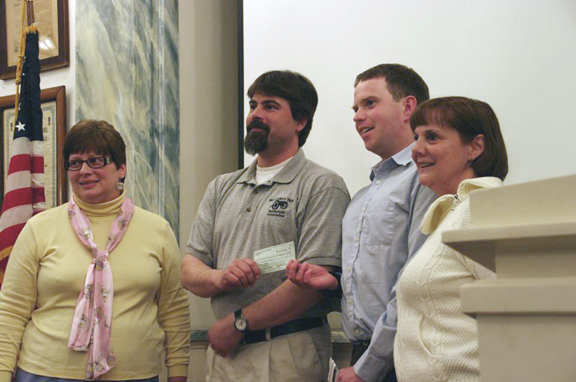 At the May 2012 Board meeting it was voted to donate $1,000 to aid in replacing the boiler in the GAR Hall. The Civil War Round Table has held their meetings in the historic Hall for many years. The donation will go toward the approximately $9,000 that is needed to replace the boiler system. With the new boiler, the Round Table meetings in the winter months will be more comfortable. 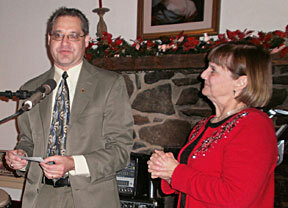 At the 2011 Christmas Banquet, Cindy King presented Wayne Motts, of Adams County Historical Society, a check for $1000. The Roundtable donatation will help with the restoration of a rare portrait of David McConaughy. The portrait was dontated by family members to the ACHS. It is estimated that it will take $5,000 to $5,500 to restore the painting. At the Ocotober meeting, 2011, the Roundtable presented a check to Gary Crawford, president of the Kernstown Battlefield Association. Kernstown was the first battle fought in the Shenandoah Valley, the beginning of Jackson's famous Valley Campaign. It was also the first and only defeat suffered by the mighty Stonewall in the Civil War and while a tactical defeat it had a far reaching strategic impact. The Battlefield was the destination of the CWRT spring trip in April. Many members were impressed by the preservation efforts. The check was presented by CWRT former President John Winkelman and current President Cindy King. In March 2010 the Gettysburg National Military Park gave Cooper’s Battery B reenacting unit and Cooper’s descendants per-mission to replace a monument dedicated to Cooper’s Battery on East Cemetery Hill. This “Memorial Shaft” was dedicated in August of 1880 and was the first artillery monument and the tenth overall to be placed on the field. Over the years weathering has rendered the in-scription on the cap stone illegible and the purpose of this project is to replace that stone. The NPS has removed the stone to examine it as there are some questions as to it’s inscription while this group has begun to raise money for it’s replacement. The estimated replacement cost is $12,000. All money raised will be held by the Pennsylvania Get-tysburg Monuments Project until enough money has been raised to purchase and engrave the stone. The officers and board members of the GCWRT all felt this was a perfect preservation project for us to get involved in. It is for a monument here on the Gettysburg Battlefield and it is for a veteran Pennsylvania Unit that saw action on all three days here. 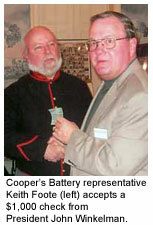 Accordingly, at our November monthly meeting a check for $1,000 was presented by our roundtable to Keith Foote representing Cooper’s Battery. Other groups are also donating and hopefully this project can be completed quickly. The David Wills House Museum unveiled a restored portrait of James Wills, father of David Wills, in November of 2009. The portrait, attributed to a Gettysburg area artist, David S. Forney, was received by the Adams County Historical Society from a member of the Wills Family in 2004. At that time the likeness was not identified. Thanks to a photograph held by another branch of the family, a copy of which was given to the Society, the identity of the man was discovered to be the father of David Wills. The painting just underwent conservation by Cumberland County-based conservator Brian R. Howard of Brian R. Howard Associates, Inc. The cost of the conservation work was slightly over $5,000 and included the repairs to the actual canvas, cleaning of the work, and restoration of the frame. This expense was underwritten by donations from the Donors to the Adams County Historical Society, including the Strong Family Endowment; Military History Online, Battle of Gettysburg, Internet Discussion Group; and Gettysburg Civil War Roundtable (donated $1533). The portrait is on long-term loan to the National Park Service from the Adams County Historical Society and is on display. ABOVE: Shown at the unveiling of the restored portrait of James Wills are, from left, Greg Goodell, curator Gettysburg National Military Park; John Winkelman, president of the Gettysburg Civil War Roundtable; Wayne Motts, executive director of the Adams County Historical Society; Deb Adamik, executive director of Mianstreet Gettysburg and Jennifer Roth, Wills House Museum manager. Photo by John Armstrong/Gettysburg Times. Following the Gettysburg Civil War Round Table's recent Baltimore trip, the board decided to participate in the "Adopt a Confederate Veteran" program by the Col. Harry W. Gilmore Camp #1388 of the Sons of Confederate Veterans at Loudon Park Cemetery in Baltimore, MD. You can check out their website at http://www.mdscv.org/1388 and click on the "Adopt a Confederate" link. Our organization "adopted" Capt. 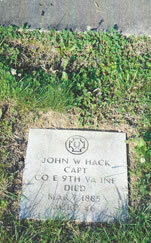 John W. Hack of the 9th VA of Armistead's Brigade and Pvt. James C. Weller of the 24th VA of Kemper's Brigade. The gravestones of these two individuals are barely readable. Our donation covered the costs of a 12" x 12" granite stone to be placed at ground level in front of the original stone at each grave. A dedication ceremony was held on June5, 2010. 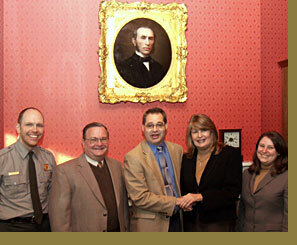 September 27, 2008, Roundtable officers and board members present check to Deb Adamik, Executive Director Main Street Gettysburg for Wills House restoration. for our Adopted Position, the Alabama State Monument on Confederate Avenue. Whereas, The monuments at the Gettysburg National Military Park stand as lasting memorials of the Battle of Gettysburg and its place in history as a turning point in the Civil War and as tributes to the soldiers who served in that momentous conflict. With the creation of organizations such as the Pennsylvania Gettysburg Monuments Project and the help of groups such as the Gettysburg Civil War Round Table, those who were involved in America's struggle to survive as a nation during the Civil War will long be remembered and appreciated. And directs that a copy of the citation, sponsored by the Honorable Harry A. Readshaw on June 9, 2000, be transmitted to the Gettysburg Civil War Round Table. With the 150th anniversary of the Battle of Shiloh before us, you and I have an once-in-a-lifetime chance to save 491 acres of battlefield at Shiloh. This rugged swath of land is one of the last and largest areas of major combat action that remains to be saved at this historically important battlefield. Did you know that the Battle of Monterey Pass was the second largest Civil War battle in Pennsylvania? It is also the only Civil War battle to have taken place on both sides of the Mason and Dixon line and in four counties. This significant battle is in need of your help!